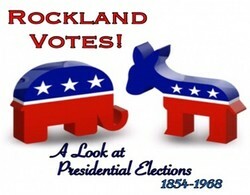 The exploration of presidential elections in "Rockland Votes!" takes as its starting point the emergence of the two major parties, examining in detail candidates, issues, and specific Rockland County contexts for a selection of elections of the 19th and 20th centuries. Through the display of campaign objects and other items from the HSRC collection, the exhibition,curated by Education Coordinator Richard Donegan, explores the issues that resonated with Rockland residents of the past, with an eye toward the issues that continue to do so in 2016. In 1788, George Washington was unanimously elected the first President of the United States. He and his running mate, John Adams, ran essentially unopposed and stood for no political party. Their ticket was reelected to a second term in 1792. In the intervening four years, however, two major political parties -- the Federalists and the Democratic-Republicans -- had emerged. They would run opposing candidates in the 1796 election: John Adams (F) and Thomas Jefferson (D-R). By the election of 1828, the Democratic-Republic Party had officially become the Democratic Party. And in 1854, the Republican Party was formed. From the election of 1856 through the present, these two parties have dominated U.S. presidential elections, although third-party and special-interest candidates have occasionally drawn the spotlight as a reflection of the issues of the times. Finally, cast a ballot for your favorite candidate from history in an antique Rockland County ballot box. "Rockland Votes!" is open Wednesdays through Fridays and Sundays, 12-4 pm, until November 6. Admission is free of charge. For information or to schedule a group visit, contact Lisa Delmonico, Museum Services Assistant, (845) 634-9629 or memberservices@rocklandhistory.org.